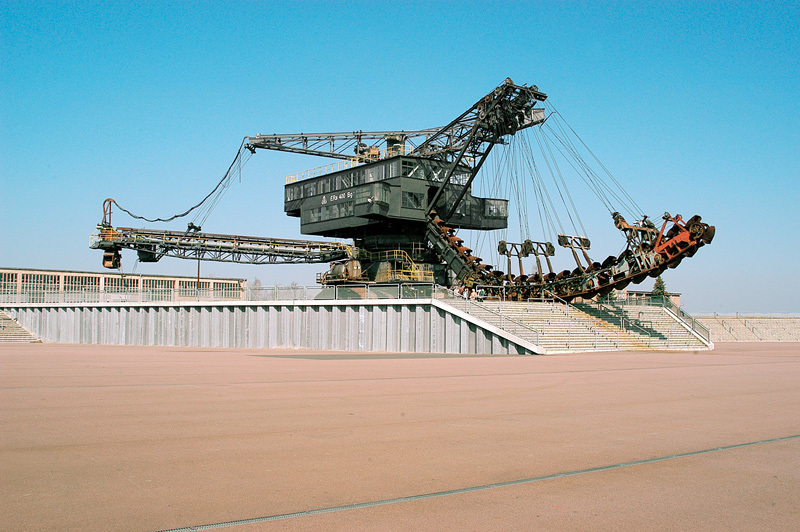 Ferropolis – or the iron city – is a museum in Gräfenhainichen, east of Dessau. It is a former opencast mine known as Golpa-Nord where brown coal was mined. It was shut down in 1991 and transformed into an open air museum and venue for special events. Until 1995 5 massive pieces of large equipment were brought here from all over the area and were then opened to the public. Today, visitors can not only experience the former mine, they can also enjoy concerts and other events here. We came to Ferropolis to see the Fisherman’s Friend Strongman Run, a 10 or 20 km night run across an obstacle course. We arrived well before the event and had enough time to have a closer look at the heavy machinery. A spreader consists of an undercarriage, a rotating superstructure with a boom for ejecting the spoil and a material intake. It is used for dumping the spoil of the opencast mine. The spreader Gemini operates on rails and can be rotated. The massive construction was built in 1958 and has to be operated by 6 to 8 people. This digger was built in 1941 and 3 to 5 people are needed to operate it. 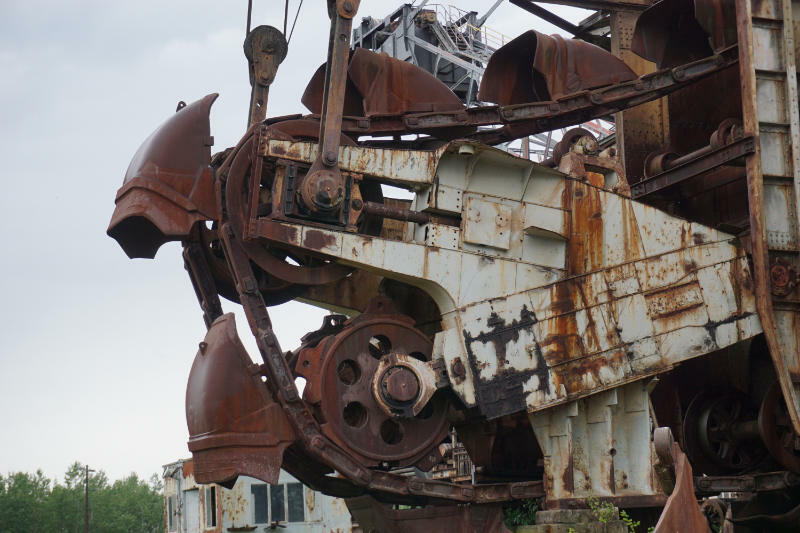 Bucket-chain dredgers are used in opencast mines and underwater mines. The material is dredged with buckets that are fixed to a chain. Rotary excavators are the world’s biggest diggers. They, too, are built on an undercarriage but they have a superstructure that allows to take on spoil on a blade wheel on a boom. The rotating blade wheel takes on the spoil and lifts it on to a ramp that leads to a conveyor belt from where the spoil is led away from the machine. Standing next to this rotary excavator makes you feel very, very small. The blades are huge and the output of this machine must have been immense. I have a better picture now of how it must have looked like here back in the days where these gigantic machines dug deep into the earth and left these enormous craters. Honestly speaking, I was blown away by the machines and their size. Unfortunately, due to the upcoming event there were no more tours offered on that day. But I think that we’ll certainly come back. 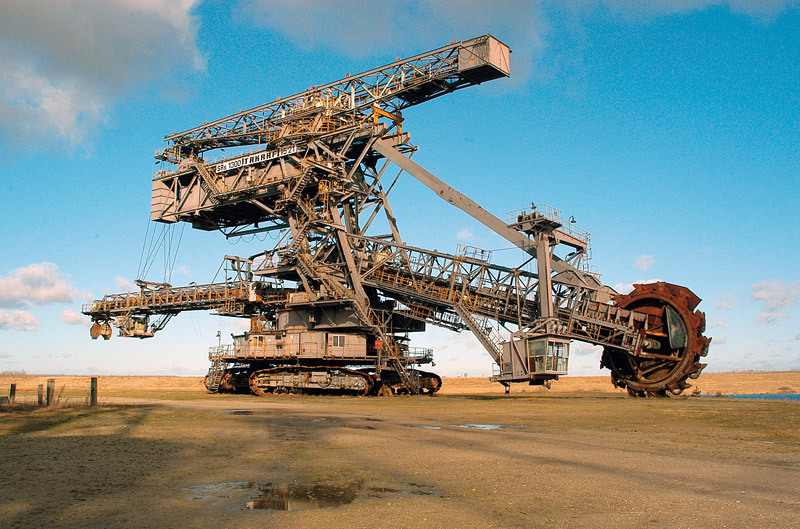 This would give us the opportunity to climb on top of these machines and have a look at the re-natured former mine. I can imagine that standing on top of these beasts makes you feel even smaller than just standing next to them. What we’ll keep in good memory is how the area and the machines were lit up at night. The light design was multi coloured and kept changing frequently. This made the machines look even more humongous and monstrous.